With summer just a few weeks away, strawberries are everywhere right now. Here in the Northeast, our plants have flowered, but it will still be a couple weeks before the berries have formed. However, the season for this delicious low carb fruit is certainly in full swing in the warmer parts of the country. The prices have really come down in the last couple weeks. 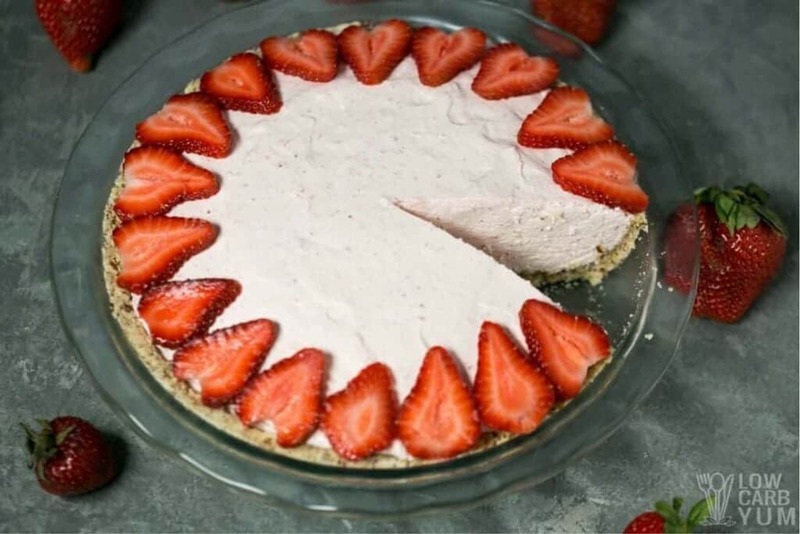 It’s been unseasonably warm here in Southern New England with temperature reaching 90 degrees F. So I decided to try making a no bake low carb strawberry mousse pie. For the pie crust, I used a mix of ground pecans and almond flour. To help the crust stick without baking, I added in some zero carb Isopure whey protein isolate. 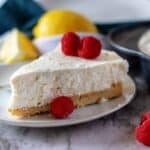 The crust is very similar to the one on the no bake cheesecake bars at Low Carb Maven. 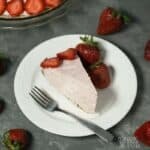 You may notice that I didn’t use any bulk sweeteners like Swerve or Sukrin in this low carb strawberry pie . The reason is that I’ve been trying to avoid erythritol. I seem to be particularly sensitive to the erythritol sugar alcohol. Not only does it seem to cause weight issues, but I also get discomfort from it when it passes through in urine. You know that cooling effect that erythritol is known for in the mouth? Well, I get a similar sensation when it comes out the other end practically unchanged. 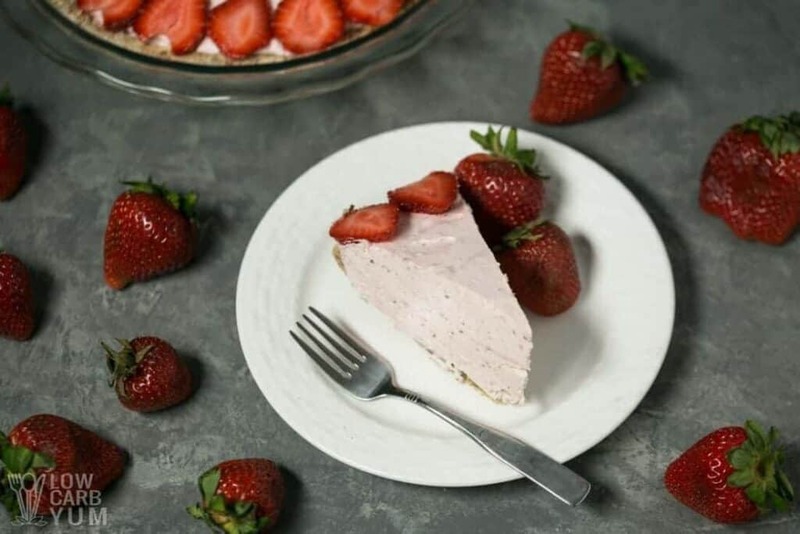 That’s why I used concentrated stevia powder and monk fruit powder in this low carb strawberry mousse pie. 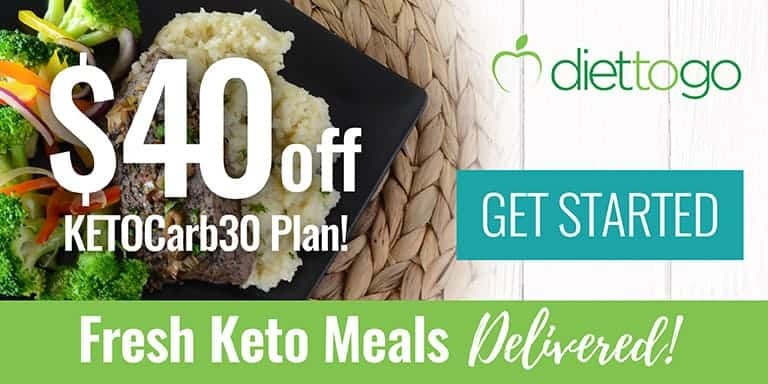 They are zero carb sweeteners that don’t cause any problems for me. My favorite sweetener is monk fruit as it has the best taste when used alone. I add stevia to it, though, because it’s more concentrated so I use less sweetener. If you’ve never had plain monk fruit, you need to give it a try. 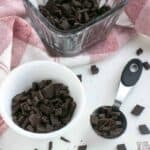 It’s the only sweetener used in my favorite low carb chocolate made by ChocZero. Monk fruit is also known as lo han guo. 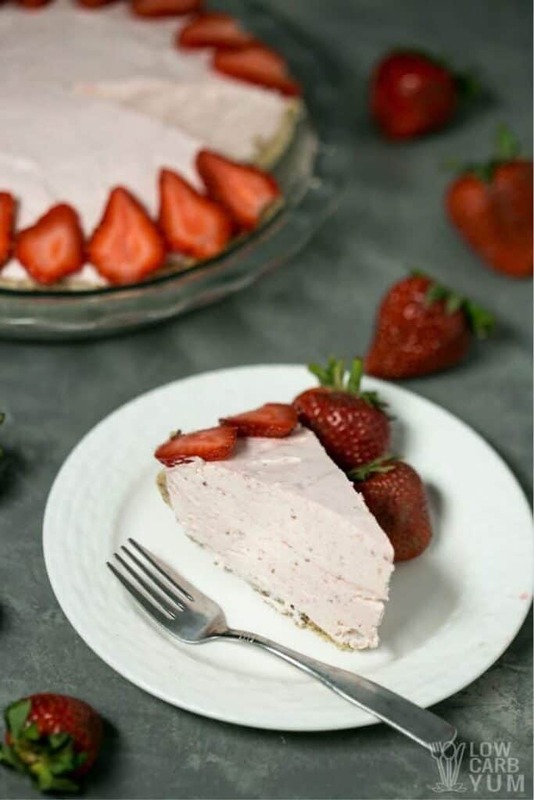 I may try making this low carb strawberry mousse pie with only concentrated monk fruit powder to see how it compares. The stevia powder is twice as strong as the monk fruit powder so I’d need to double the amount. 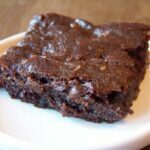 A lot of other low carb recipes rely heavily on erythritol. 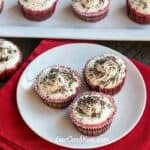 And, it’s difficult to make certain things like low carb frosting without a bulk sweetener. 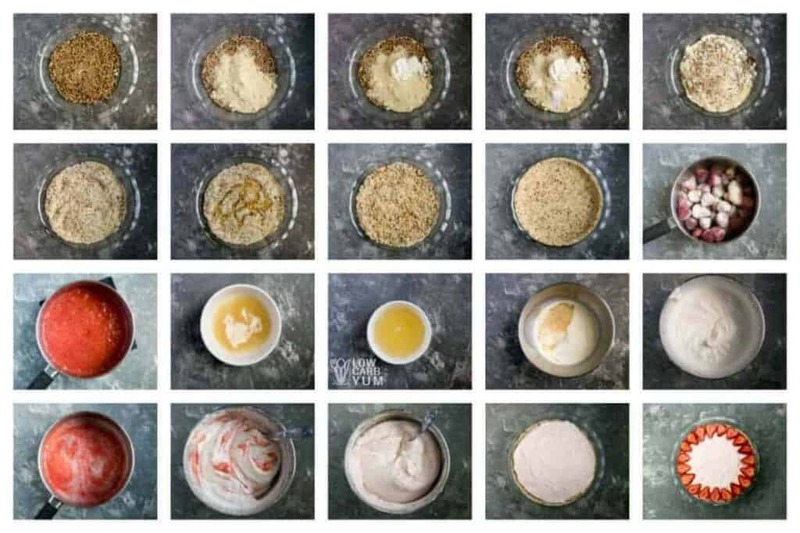 For those of you who would rather not invest in a new sweetener, I’ll try to provide recipe notes in this and future sweet recipes if you’d rather use a one-for-one sugar replacement. 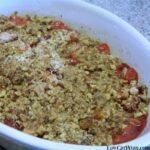 Any low carb berry can be used in place of the strawberries in the filling. In fact, the original mousse recipe used raspberries. You can find that recipe here. 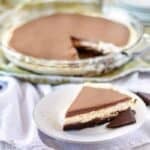 If you’d like to try another great light and airy pie, check out the dark chocolate mousse pie recipe. I used a peanut butter crust in that one, but you can use any crust you’d like. 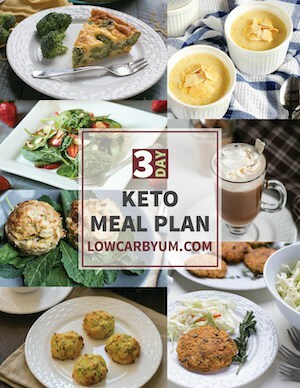 An easy to make low carb pie that takes little time to prepare. 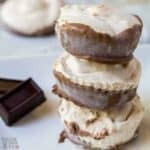 It's a light and airy no bake icebox pie that sets in the refrigerator. Combine all crust ingredients in 9 in deep dish pie pan. Stir in butter thoroughly then press evenly on bottom and sides of pan. In small bowl, sprinkle gelatin over 3 tablespoons cold water to allow gelatin to soften. Add 3 tablespoons boiling water and stir until the gelatin is completely dissolved and mixture is clear. Set aside. If using frozen strawberries, heat them in pan or microwave until thawed. Add stevia and monk fruit to strawberries and puree with blender. Stir in gelatin mixture. Set aside. 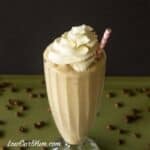 Whip heavy cream with vanilla extract until soft peaks form. Then slowly fold in the pureed strawberry mix. Pour into chilled crust. Top with additional sliced strawberries if desired. Place in refrigerator and allow to chill until set, about 4 hours. The crust requires about 1/3 cup sugar equivalent sweetener and the filling needs about 3/4 cup sugar equivalent such as Swerve or Sukrin. 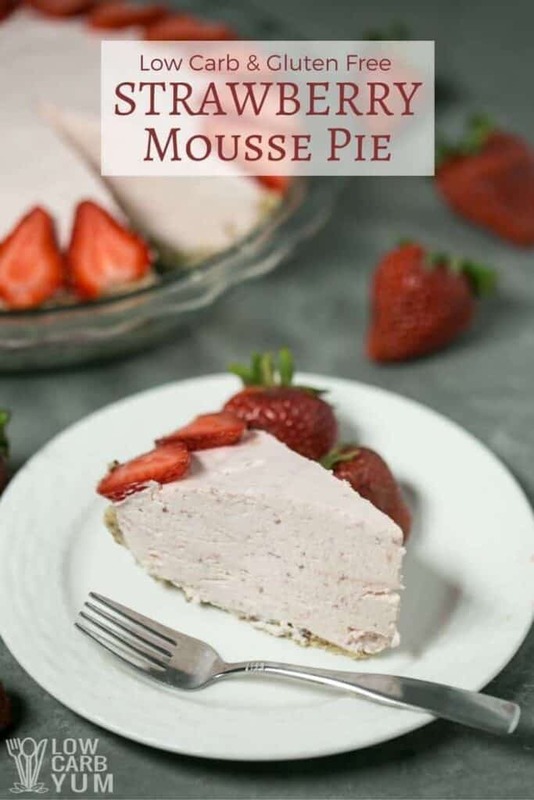 What would the nutritional count be if made only the strawberry mousse without the crust? Added the information to the recipe notes. 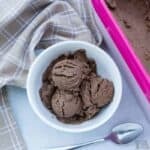 What is a good substitute for protein isolate? You can just use almond flour. Sounds tasty! Strawberries start showing up around mid June, I can’t wait! 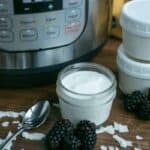 I may try a little experiment, mixing the fruit and the cream in my cream whipper, shake it up, and spray out some mousse. Just like cheesecake, I don’t need the crust, I just like the filling. I’m thinking that would work, but I’ve never tried it in my whipper. I can’t do dairy. Do you think that whipped coconut cream would work? It should work fine in this recipe.